Roasting brings out the best in a lot of vegetables. With cauliflower, it tames the sharp bite so many people don't care for, and highlights the sweet and nutty flavor that lives at the heart of all good cauliflower. Adding a bit of garlic to roast alongside it just amps up the delicious fun. The bit of grated Parmesan over the cauliflower when it comes out of the oven adds that salty kick and lets the cheese soften and melt into the crevices of the cauliflower. Yum. 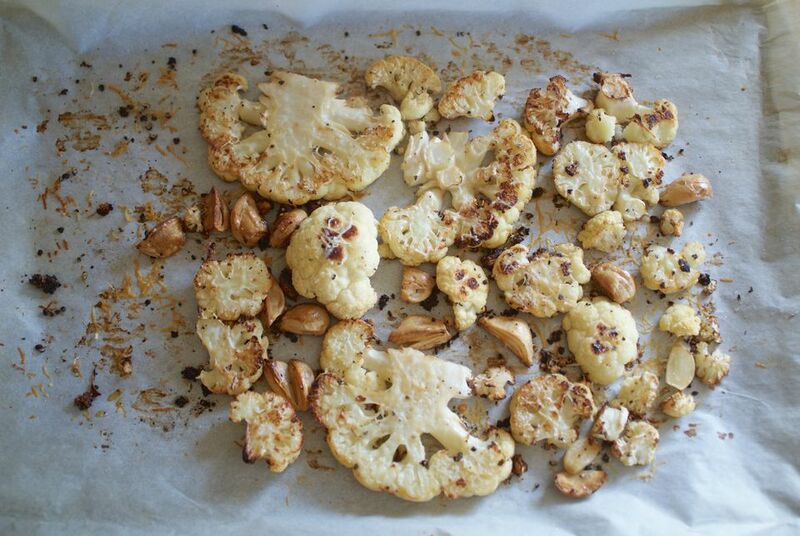 This dish is beyond easy: Slice or chop cauliflower, toss with seasonings, stick in the oven. I've been known to eat an entire head of cauliflower cooked this way. Consider yourself warned. Trim the cauliflower. Cut off and discard the bottom and remove and discard any green leaves attached to the head. Cut out the core. Most recipes have you toss this, but here are can slice it (about 1/4-inch-thick) and roast it up, too. Divide the cored head into florets or simply cut entire thing into 3/4-inch thick slices. The slicing method will yield a few bigger "steaks" of cauliflower and a bunch of smaller pieces that break off. Lay the sliced cauliflower on a baking sheet (you can line it with parchment paper, if you like) and scatter the garlic cloves about. Drizzle with olive oil and use your fingers to smear everything with the oil and turn all the pieces over so everything is more or less coated with the oil. Sprinkle with salt and pepper, and roast until almost completely tender, about 30 minutes. Remove from the oven, turn all the cauliflower and garlic over and mix it around on the baking sheet. Sprinkle the cauliflower with the Parmesan and bake until the cheese is melted and the cauliflower is fully tender, about 10 more minutes.